Choose carrot sticks instead of chips or crackers for a snack. Carrot sticks are a healthy, low-calorie food. They're a good source of dietary fiber, vitamin A, vitamin K and manganese. A serving of seven carrot sticks has 35 calories, according to the CalorieKing website. This snack contains no fat or cholesterol. A serving contains 60 mg of sodium, 8 g of carbohydrate, 1 g of protein and 20 mg of calcium. Carrots are pro-vitamin A carotenes, which may act as antioxidants, according to the National Institutes of Health. Vitamin A is important for immune system function, vision, bone growth, reproduction, cell division and cell differentiation, according to NIH. Dip your carrot sticks in hummus to get filling fiber. 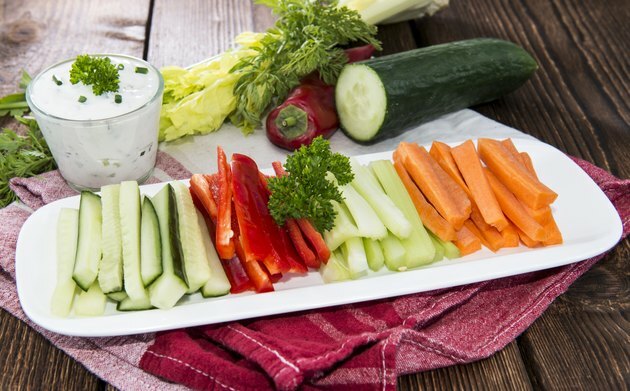 The McKinley Health Center of the University of Illinois at Urbana-Champaign recommends having a snack of 20 medium baby carrots with one-half cup of 1 percent fat cottage cheese and two tablespoons of fat-free ranch dressing. Substitute carrot sticks for baby carrots.